Liverpool did very well in their 1-1 draw with Arsenal at the Emirates Stadium on Wednesday. Manager Rafael Benitez was conducting the game from the sidelines, I think he sat down once, and the tactics came right for him once again on a European night. Liverpool are very disciplined and well organised in terms of knowing how to defend. 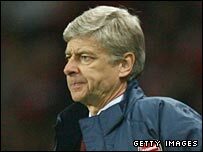 But I think Arsenal manager Arsene Wenger will be a little disappointed. I expected more from Arsenal. I thought that they would win this tie 2-1, with Liverpool scoring an important away goal. The Gunners took the game as much as they could to a very good team defensive team but failed to create many chances. In the second half did they look as if they were about to get in behind the Liverpool defence. Arsenal took the lead in the first half and it does not matter what level you play at - when you have just scored you have to really have your concentration at 100% for the next few minutes. For Liverpool to then equalise three minutes later was a great boost for them. Their goal was very well made by Steven Gerrard, who went past two or three players before cutting the ball back for Dirk Kuyt to score. People talk about Arsenal's inexperience but, as far as I am concerned, you have to be able to cope. Yes, this is a learning curve for them but quite a few of their players are quite experienced already. The return leg at Anfield will be a fantastic night, with a great atmosphere. It will definitely lift the Liverpool players and it will be important how the Arsenal team reacts. Arsenal will score at Anfield but I think like usual we will concede...penalties here we come! I think that a lot depends on the first goal. The tie is now in Liverpool's favour but do not rule out the possibility of Arsenal scoring at Anfield. As for Chelsea, who lost 2-1 at Fenerbahce - I always thought that would be a difficult game. Unless you have been to Fenerbahce or other such places in Turkey, you do not really know what the atmosphere is like. It is not easy to handle. Having said that, I still expect Chelsea to go through.